New year and new 'Meet' series - my chance to interview anyone involved in African literature that I would love to meet in person. Next up is Onyinye Iwu - a talented young illustrator and designer whose unique style I absolutely love, love, love. The illustrator behind the Ankara Press book covers, I featured her on the blog back in 2015 as part of my 55 years of art in Nigerian literature celebration, but I had been following her work from afar probably since 2014. 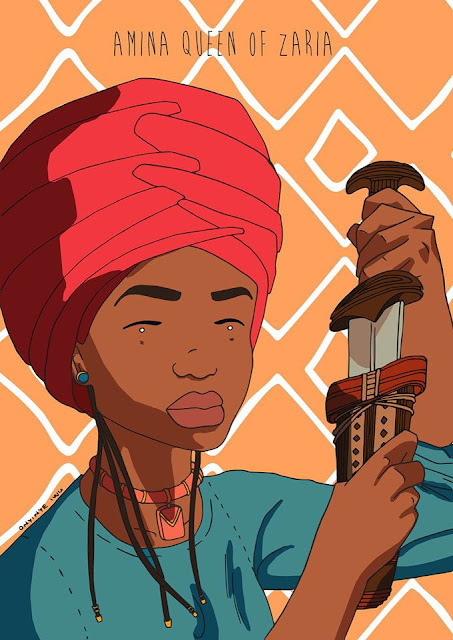 I had seen the drawings (of young women with amazing natural hair, and or amazing headwraps), but had no idea who the artist behind them was. And being me, I had to do my research and find out who the creator of the pieces were. Since my initial feature, Iwu has gone on to design more covers for Ankara Press and Cassava Republic Press, and launched the inspirational Queen of Africa series. 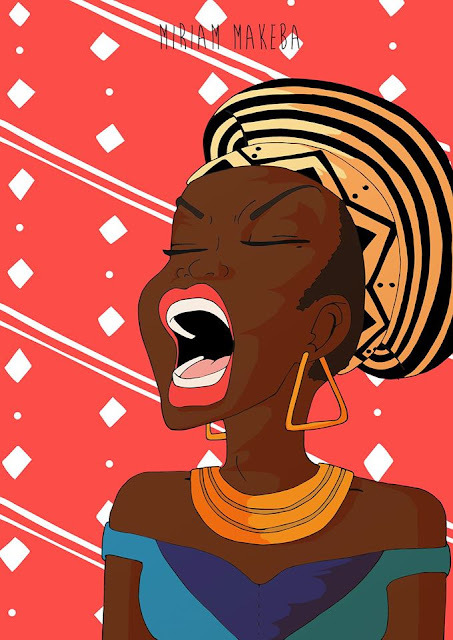 Born and raised in Northern Italy, before relocating to London as a teenager, Onyinye Iwu shares her experiences of taking up illustration (instead of architecture), how one of her first projects as an illustrator was inspired by her wanting her younger sister to love her natural hair, her distinctive 'Afropop' style, what it's like working on commissioned pieces and her top tip for illustrators. I am very honoured that Onyinye took the time to answer some of my questions for the blog (thank you) and I hope you enjoy! Can you tell us about yourself (where you’re from, what you do, any fun details)? 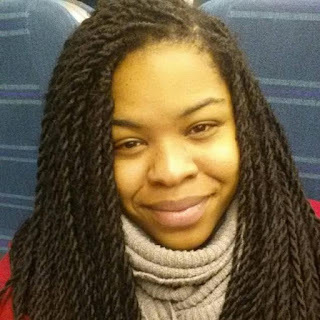 My name is Onyinye Iwu, I was born in Brescia, a city in Northern Italy and that's where I lived until I was 13 when my family and I relocated to London in England. Both of my parents are Nigerians and so brought me up a fully fledged African in Europe. I am a freelance Illustrator and full time Design Teacher living in London. How did you become interested in illustrating? I grew up as an only child until I was in my teens - drawing was always a passion of mine. It was never a career choice, not at first anyway, but I always knew it was something I would do. 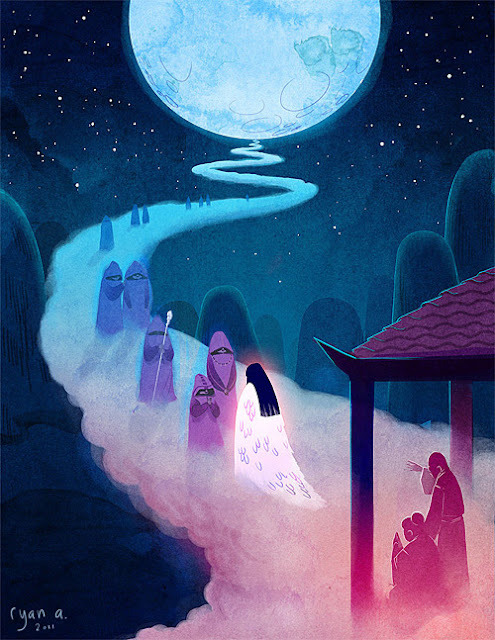 Could you describe your journey to becoming an illustrator? I studied architecture at university, but by the end of my degree my mind was elsewhere. I was already considering other options as I couldn't see myself working as an architect. I had many ideas in my head but I didn't know how to put them down. There was also a lot of internal conflict between what I wanted to do and what I was expected to do. I knew I wanted to draw, and I wanted to talk about identity and literature - I just couldn't quite identify a career. I pretty much stumbled upon the idea of becoming an illustrator. I wanted my art to be more than self expression, it needed to teach. Do you remember the first illustration you ever drew? Yes, well it is not exactly my first illustration but my first project as an aspiring illustrator. 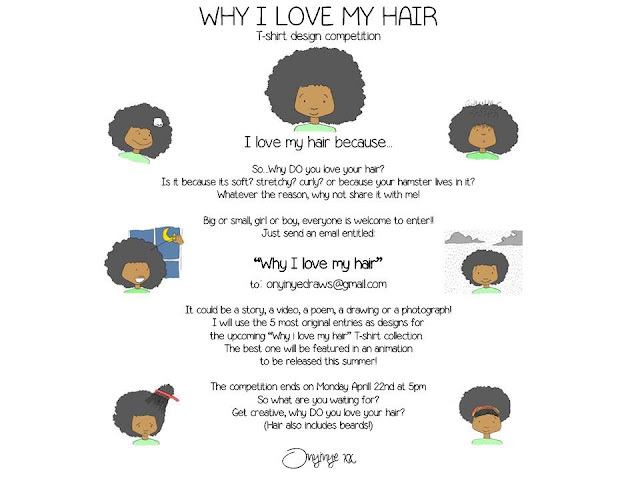 Back in 2013 I wrote a poem called 'Why I love my hair' with illustrations for every stanza. I was inspired by my little sister who, at the time, was contemplating using a hair relaxer on her natural hair to look like 'all the other girls at school'. This poem was to inspire her and remind her (and all little black girls) that their natural hair is beautiful! 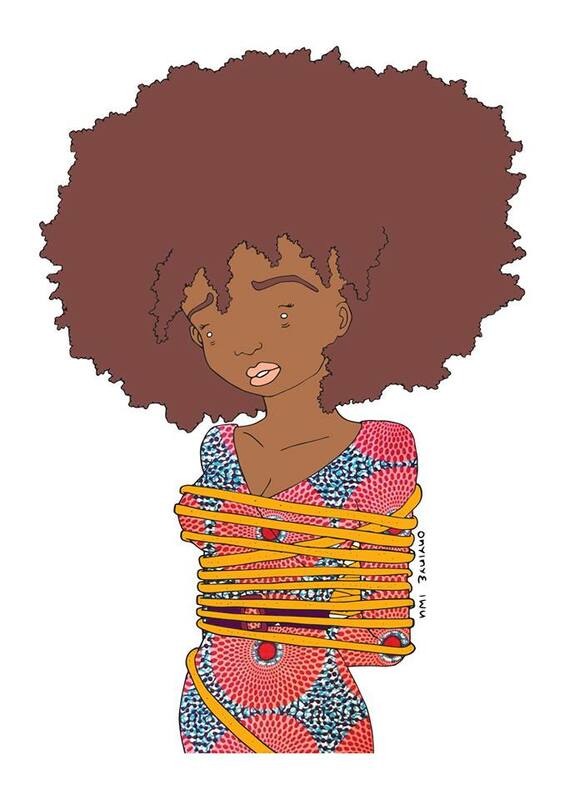 Image via Onyinye Iwu Illustration. My work is Afropop. All I do is African themed, from my characters to my backgrounds, I want to create vibrant, colourful and energetic illustrations. I take inspiration from the African atmosphere, from the colourful patterns on the fabric, to our colourful mix of languages, and our vibrant and harmonious music. How did you develop your distinctive artistic style? It took me a while to realise where my talents lay in illustration. At first you try to draw what people like, or in a particular popular style. I ended up studying my scribbles, the work I did without any references and realised my best work always had funky patterns and simple characters. This worked because it was me, it came naturally, it was not forced. Do you have a favourite piece you’ve created? I like all my illustrations but my favourite project so far has been 'Queens of Africa' it embodies everything I want to incorporate in my work - it's African history, it's celebrating identity and representation, with vibrant images and colours and best of all it is teaching -passing knowledge to children and adults alike. I had a very long creative slump before starting 'Queens of Africa'. I was so focused on my career as a teacher and on commissions that I let my own personal work fall to the side. My way of coping and becoming inspired again is to attend afro centric events. It's always inspiring to listen to like-minded people talk about their passions and dreams. Another method is relaxing, taking care of yourself and doing nothing for a few days - the urge to create suddenly comes back! Who are the artists that you admire and that inspire you? The two main artists I admire are Paul Davey and Ryan Andrews - very different styles but I love the way their work tells stories effortlessly. 'Think Twice' by Jamaican freelance artist, Paul Davey. Image via Deviant Art. What’s the best/most fun part of your job? I love the process of illustrating, but the most rewarding part of this is the end, when you see your final creation. You feel like you have given a little more of yourself to the world. What’s the worst/most difficult part of your job? Probably negotiating pay and promoting. I am not great at either and would rather not deal with them. It's frustrating when people don't appreciate the value of your work and ask for discounted prices on commissions or worse 'free' illustrations. It used to make me doubt my work, now I just politely decline. I don't like to be centre of attention, I find it hard to advertise myself or my work, as much as I want people to see it, I don't like asking. I have to work on that. Tell us about your involvement with the Ankara Press books? I was approached by Bibi Bakare-Yusuf about designing the brand and cover for a new series of African Romance novels. I was sold from day one. I love literature and it was my dream to get involved in such a project. What was your creative process when responding to that brief? It was a very lengthy process - my first major project and there was a lot at stake. The key was the continuous communication between myself, Bibi and Emma Shercliff - who started up Ankara press as an imprint of the already successful Cassava Republic. What about other briefs – the cover design for Kaye Whitman’s Lagos: City of Imagination, Chikodili Emelumadu’s The Fixer and Nnedi Okorafor's What Sunny Saw In The Flames for example - what was the creative process for that? Every book is different, so is my process. Obviously reading the book or excerpts from it and also having a general design concept from the author always helps. But in essence It's always about communication, getting the right balance of what your client wants and how you interpret the brief. It's definitely not easy, and can get frustrating at times but the end result is always rewarding. How do you maintain your own style in a commission? Sometimes it's a struggle, what I tell myself is that as much as I need to do this in my style, when completing a commission I am creating someone else's idea, I am making their dreams come true, it may not always be exactly what I want but the aim is to have a happy and satisfied customer. Which commission have you most enjoyed? I really enjoyed creating a set of illustrations for a poem by Peace the Poet, his work really inspired me, the words spoke to me even before I started working on the drawings. 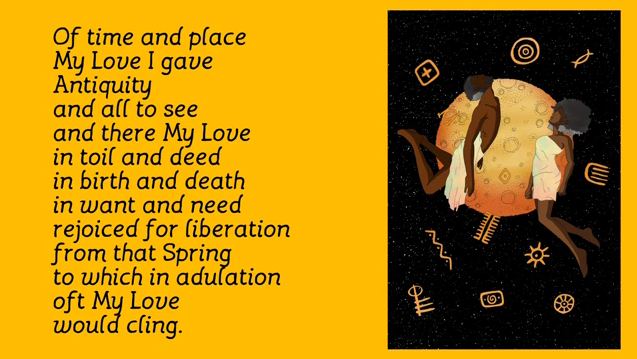 Still from 'Spring Love' by Peace the Poet. I don't really have one. 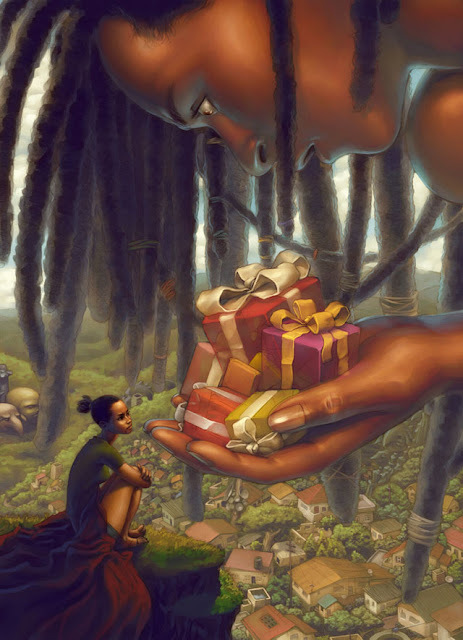 I just want to keep illustrating brilliant African literature whether is through a book cover or through inner illustrations that tell a story. Tell us about the Queens of Africa series? It started off as a simple idea, I never thought I would take it this far. I just wanted to celebrate women, literal and metaphorical queens, all those women who helped to uplift their people in all parts of Africa. How did you choose the Queens to feature? And how do you go about designing these phenomenal women? Before starting a did some research of African inspirational women, sadly my results were mostly about African-American women, it took a while for me to come up with a list of women I wanted to feature. Some of the featured queens are from ancient kingdoms so I have very little reference images, I use some of my imagination and what is already out there to create my character and I feature a pattern to go with their story. Two of Iwu's Queens of Africa. Images via Onyinye Iwu Illustration. You have also produced two other picture books – Grey and the Lost Braid and Bring Back My Sister – would love to know more about the inspiration behind them? 'Grey and the Lost Braid' was the first fully fledged children story I have ever written, it's about a girl that finds a braid extension on the floor and tries to find out where it is fallen from. I remember seeing braids on the street when I was a child, I always felt a mixture of embarrassment and pity for who lost it but secretly I also found it very funny. 'Bring Back My Sister' was a story to highlight the family of the victims of the Chibok girls kidnapping, a young girls talks about her struggle in finding her missing sister. It's very sad because there is not happy ending. It is quite unresolved, just like the real life situation. I wanted to highlight that children are affected by this too, there is more than one victim in these situations. I am currently reading 'Dangerous Love' by Ben Okri. Absolutely enchanting so far, as are all of his other works I have come across. As an illustrator, have you ever judged a book by its cover? If so, what are some of your favourite book covers? At first I always judge a book by its cover, but as a bookworm I want to read it whether I like it or not. I do not have a favourite book cover, I read too much to have a favourite! 5 things inspiring you/your work right now? Can I say Chimamanda Ngozi Adichie? She is worth even more than 5 inspirational things. She is a role model in every way. Love everything about this woman. Your number 1 art tip? Be and stay true to yourself. Never compromise your art for popularity. 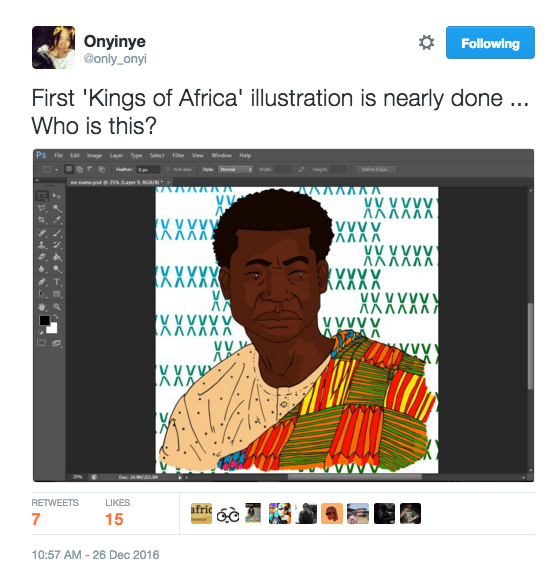 A 'Kings of Africa' series, some illustrations focusing on Igbo culture and more wonderful patterns. If you love Onyinye Iwu's illustration as much as I do, you can check them out on her Facebook page. Also, there are some super cool Queen of Africa products you can purchase, if you want a piece of Iwu's stunning and distinctive artwork.